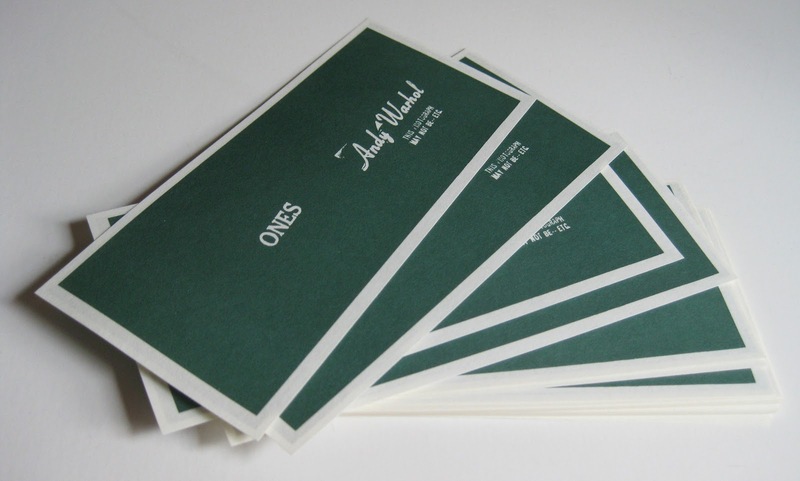 Alden Projects™ offers a stack of 50 examples of rare ephemera by Andy Warhol: Artcash “Ones” — an art currency created by the artist in 1971. All are in mint condition and with a provenance tracing back to the estate of the original publisher. Andy Warhol created his own currency: “Artcash” for Experiments in Art and Technology’s (E.A.T.) benefit — “a private casino party at Automation House, New York on December 3-4, 1971. “In addition to the Andy Warhol ones,” the 1971 invitation declares, “five artists have designed currency exclusively for this bash: Robert Whitman $3, Robert Rauschenberg $12, Tom Gormley $24, Red Grooms $51 and Marisol $88.” Printed by the American Banknote Company — then also the printer for the United States Treasury — Artcash even employs the same paper used for printing United States’ currency (but sans the government’s anti-counterfeit threads)! Tickets to the event were $25 per person, so one ticket could yield two Rauschenberg’s ($12 each) and a Warhol ($1) or one Gormley ($24) and one Warhol ($1) which would be sent through the mail. “ARTCASH in the amount of your donation will be sent to you with admission tickets to start you off on your quest for fame, glory and fun. (…) You can hoard ARTCASH, use it at the casino party, or trade it for art and other prizes.” The casino benefit was held “for the benefit of the Community Television Center and the Artist’s Television Project at Automation House.” Warhol’s “Artcash” is the currency of art itself and collecting, too. More than just a token of the thing Warhol arguably loved most, dollar bills and dollar signs were also the subject of his early and late art. The essence of Pop, Warhol’s ephemera continues to arrive before tomorrow’s parties. Get yours before they are gone. Rare and only from Alden Projects™! Warhol’s dream in 1971? Artcash “Ones” for Art & Technology! Also available framed.